I’m a book person who loves movies. I can count on the fingers of one hand the movie adaptations that I thought did justice to the book. Gregory Peck was awesome in To Kill a Mockingbird, but even he couldn’t make me feel the subtle menace in the air of that fall evening when Scout and Jem headed home from the school play, or the tension of that sweltering packed courtroom, the way Harper Lee’s words could. If I enjoy a book so much that I send copies to friends, and insist that my sons read it, and read parts out loud to my poor, long-suffering husband, then it is almost a certainty that the movie will ruin it for me. 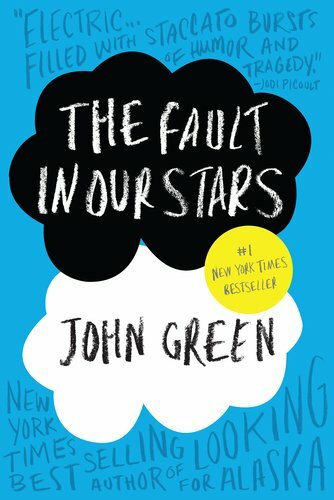 I adored John Green’s The Fault in Our Stars. It was the best book I read last year. I know I’m supposed to be too old to enjoy young adult novels, but this one was just SO good. I laughed much more than I cried. The teenagers were like kids I know, except for their unusual circumstances. They talked the way I imagine my sons and their friends talk when we smothering parents aren’t around. I fell in love with them. I implore you, if you ever read at all, read this book before you see the movie. The trailer is good – it’s wonderful – and I will see the movie. But the book is perfect. Read it. I felt so judged by this woman’s opinion on Twitter. I know she didn’t read my post, but still. 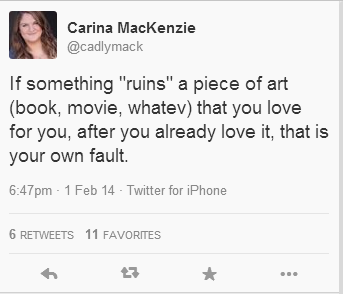 I don’t think it is my fault if someone casts a horrible actor in a movie adaptation of a book I loved. I’ll still love the book, but the vision I had of the character in my head will forever be that person and it’s hard to go back and make it not be. If a movie adaptation completely changes the plot (I’m looking at you, Gillian Flynn) then I might like it or I might not. And so what if it is my “fault”? I don’t like coconut and I think it ruins any food it touches. Likewise ketchup. It’s my taste, my opinion, my like, my pleasure. Don’t judge my disappointment, lady.